Serendipity Arts Festival Goa 2017 witnessed the presence of Goa’s Chief Minister Manohar Parrikar as the Chief of Ceremonies, accompanied by Sunil Munjal, Chief Patron and Founder, Serendipity Arts Foundation Goa 2017, Dalmia from Dalmia Bharat Group, Ameet Nivsarkar, Vice President and Head, Corporate Affairs, Tata Consultancy Services. The preview took place at the Chandelier Room, Adil Shah Palace, Panjim. Spread over eight days of non-stop performances and an exciting extravaganza of displays, the festival commenced on December 15 and will conclude on December 22. 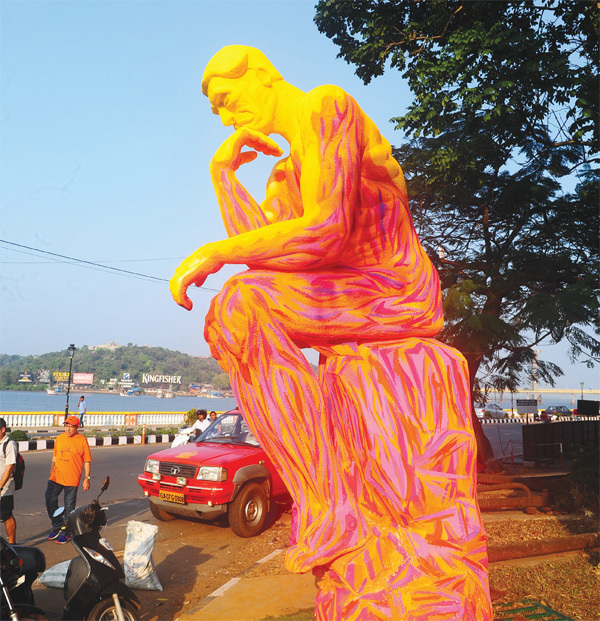 As residents and tourists marvelled at the murals adoring the buildings and structures facing Panjim, SAF-GOA 2017 has ten stages, 900 artistes, 70 shows and a multitude of performances throughout the day to mesmerise audiences. One of the key highlights of the opening day of the festival was the exhibition, ‘The Ground Beneath My Feet’, taking place on a barge that is docked on a jetty along Mandovi River. It’s an exhibition of contemporary art that brings together cutting edge performance artworks by artists. Another, was the ‘Serendipity Barefoot School of Craft – Made in Goa’ – curated by Annapurna Gerimella, an interdisciplinary selection of craft, architecture and education, and ‘A night in Harlem’ – curated by Ranjit Barot, which refabricates the vivacity of nightclubs of the golden era of jazz and effervescence of the origin of contemporary music; featuring epic proportions of music with lead vocalists, instrumentals, and choir rhythm. There’s also the ‘Young Subcontinent’ – presented by Riyas Komu, a compilation of young commissioned artists that showcase sculptures, installations, and paintings that extends patronage to cultural activists and artists; and Purush – curated by Tanusree Shankar, which breaks stereotypes and barriers through dance.